One SHSU group is putting up the red flag on alcohol abuse. As part of the Alcohol Abuse Initiative’s Red Flag Week, from May 2-6, an awareness and scavenger hunt-type event will be held on Monday and Tuesday, from 9 a.m. to 2 p.m. daily in the Lowman Student Center Mall area. The event will consist of actual red flags carrying messages of different warning signs of alcohol abuse on them being posted across campus. Participating students will sign up at a table in the mall area to receive a card, after which they will look for five flags around campus to write down certain ‘symptoms’ of alcohol abuse. The card will then be returned to the AAI’s table, where prizes and food will be disbursed, according to health programming coordinator Michelle Lovering. “ The red flags are an opportunity for interaction and learning, “Lovering said. “Hopefully it will help students learn the symptoms themselves and will give students exposure to them (the symptoms). Though the scavenger hunt will only be the first two days, the flags will be up all week, Lovering said. For more information about Red Flag Week, contact Lovering at 936.294.4347 or mlovering@shsu.edu or visit www.shsu.edu/aai. The SHSU Parents’ Association will give students food for thought during the spring Apple Days on Monday and Tuesday (May 2-3). Volunteers and association members will be in the Lowman Student Center Mall Area, near the Alumni Fountain, beginning at 8:30 a.m. both days handing out applies, Scantrons, muffins and cookies while supplies last. The event is held to provide students with support as finals draw closer and students are working on or finishing up class projects, according to Parents’ Association faculty adviser Mary Ellen Sims. The snacks will also be available for faculty members “because it’s the end of the semester for them too,” Sims said. “ We just want to wish everybody good luck at the end of the semester,” she said. Each semester, the Parents’ Association hosts two Apple Days, giving out more than 1,200 apples and 5,000 Scantrons to students to give students a treat before finals. The Parents’ Association is an organization of Sam Houston parents who actively support students throughout the year, by raising funds from member dues and the sale of merchandise for its annual scholarships. The association co-sponsors Parents’ Weekend each fall semester, welcomes new Bearkat parents during New Student Orientation each summer, as well as sponsors Apple Days and awards six $1,000 scholarships each year. In addition, an association board meeting will be held on Tuesday, at 11 a.m. in the LSC. For more information about the association or Tuesday’s board meeting call Sims, assistant dean of students, at 936.294.3026 or e-mail at mesims@shsu.edu. Students who would like a change of scenery for summer classes have the opportunity to study in Mexico through SHSU’s Puebla Field School. Classes are taught by SHSU faculty members, on the campus of Universidad Iberoamericana, in the Colleges of Business Administration, Arts and Sciences, and Humanities and Social Sciences. Courses offered for the Summer 1 session include management 430B/marketing 575B; management 430E/marketing 575A; art 493J and 493U; Spanish 263, 369 and 376; and political science 387 and 481. Through the program, students not only have the opportunity to interact with the local community, but also to attend field trips to major businesses, museums and archaeological sites, according to program director Frieda Koeninger. Lodging is provided either through a Holiday Inn in downtown Puebla for $1750, which does not include a meal plan, or through home stay with a Mexican family for $1450, which does include meals. Tentative travel dates are June 2-29. Both plans include airfare; transportation to and from Puebla from the airport; seven field trips, one to Mexico City; and access to facilities at Universidad Iberoamericana. However, tuition and fees are not included in the cost. Scholarships are available through COBA. Founded in 1531, Puebla now ranks as the fourth largest city in Mexico. The rich culture of Puebla is a blend of colonial architecture and traditional art forms with a modern business and industrial sector, Koeninger said. For more information, contact Koeninger at fol_fck@shsu.edu or 936.294.1443. The culmination of a semester of hard work for SHSU dance students will be displayed through three performances May 2-4. On Monday and Tuesday (May 2-3) dance non-majors will perform various tap, jazz, beginning ballet and salsa dances at 7 p.m. in the Academic Building 3 Dance Theatre. “ It’s really fun,” said associate professor of dance Cindy Gratz. “The place just gets so filled with parents and friends. On Wednesday (May 4), dance majors will give the audience a glimpse into “what goes on in upper-level classes” at 7 p.m., also in the AB 3 Dance Theatre. “ The major’s (performance) is a little more subdued, b/c it’s a little more serious study,” she said. All three performances will include dances “that aren’t seen any other place” or are independent studies that aren’t performed in other concerts, such as the Dance Spectrum or Dances@8, Gratz said. Following the Wednesday night performance, an award ceremony will be held to recognize the students and present scholarships. For more information contact the dance department at 936.294.1875. Pottery and clay sculptures created by SHSU ceramic students, alumni and faculty will be exhibited and sold at the Clay Club’s semi-annual sale, Monday through Wednesday (May 2-4) from 9 a.m. to 3 p.m. daily. The sale will be on the Art Complex lawn in front of Art Building F on Monday and in the Lowman Student Center Mall Area on Tuesday and Wednesday. The SHSU Clay Club is a student-run organization whose mission is to expand education in ceramics through visiting artists, conferences and workshops. Annual events such as the pottery sale help to fund an active visiting artist program and student participation in national ceramic conferences. For more information, contact Kim Childress, art department secretary, at kchildress@shsu.edu or 936.294.1315. This photo, entitled "The Horse Wrangler" by Erwin E. Smith, is one of many on display in the Walker Education Center through June 5. Pictures of famous rider Kitty Canute, cowboy artist Erwin Smith and others who lived in the times of the Old West will be on display in the Katy and E. Don Walker, Sr., Education Center beginning May 3. 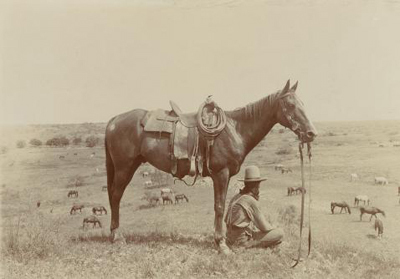 “ Cowgirls and Cowboys of Texas,” a photograph collection of “real old-time cowpokes, wranglers and hands” in the 19th Century and early 20th Century from the Library of Congress archives, will be on display through June 5, according to curator of exhibits David Wight. “ We thought it would be of interest to the community; cowboys and Texas are almost synonymous,” Wight said. For more information, visit the Sam Houston Memorial Museum Web site or call 936.294.1832. The SHSU School of Music will end its semester with piano trio and orchestra concerts this week, beginning on Monday (May 2). SHSU faculty members Andrew Wilson, Lisa Vosdoganes, and Sohyoung Park will perform on the violin, cello and piano, respectively, for the trio concert on Monday, at 7:30 p.m. in the Recital Hall. The three will perform two major works for their instrumentation, “Trio in D Minor, op. 32” by Anton Arensky and Ludwig van Beethoven’s Piano Trio No. 1 in B-flat Major, op. 97 "Archduke.” Concert admission is free. On Thursday (May 5), the SHSU Symphony Orchestra and the SHSU Chamber Players will give the audience “An Evening of Encores,” with a concert consisting of “a variety of styles and genres with music from Handel to Puccini,” according to Patricia Card, assistant professor of music. The concert will begin at 7:30 p.m. in the main auditorium of University Heights Baptist Church, with guest student conductors Veronica Wilson, Ryan Gilchrist, Clay West, Brian Eisemann, Wesley Robertson, Justin Nuckols and Patrick Newcomb. Solo performers for the concert include Wendy Raines and Geoff McInturf, oboes; Kimber McClellan, bassoon; J.T. Frankney, trumpet; Joel Bernal and Andrea Harrell, clarinets; Brendan Emig, baritone (voice); Rachel Saines, soprano (voice); and Erin Daniel, violin. Concert admission is free for those with an SHSU ID, $5 for students and senior citizens and $8 for the general public. Dan Richard Beto, executive director of SHSU’s Correctional Management Institute of Texas, was recently awarded the prestigious Charles W. Hawkes Lifetime Achievement Award from the Texas Probation Association. Beto was given the award at the organization’s annual conference on April 12 in Austin. Prior to being named CMIT executive director in 1994, Beto devoted more than a quarter of a century to the probation profession. During his career, Beto served as a juvenile probation officer in Harris County, U. S. Probation Officer for the Southern District of Texas, and was director of two community supervision and corrections department in Texas. As CMIT executive director, Beto is responsible for the Texas Probation Training Academy, which delivers a majority of probation officer training in the state. A past president of the Texas Probation Association and the National Association of Probation Executives, he also served on the Reinventing Probation Council of the Manhattan Institute. The award, the association’s highest honor, is named for the late Charles W. Hawkes, who served as chief probation officer for Jefferson County and who was one of the leaders in advancing the probation profession.